The Centre congratulates Dr Luke Selth on receiving a 2017 Faculty of Health and Medical Sciences Executive Dean award for research excellence. This was presented to Luke by Professor Burt, Executive Dean of Medicine, at the Faculty’s end of year event. Luke is Head of the Prostate Cancer Research Program in the Dame Roma Mitchell Cancer Research Laboratories (DRMCRL). Luke was the fourth Freemasons Foundation Centre for Men’s Health Research Fellow appointed in 2010. This appointment followed completion of his post-doctoral research placement in the UK and allowed him to return to his home town to further his career. The Fellowship enabled Luke to establish his research program under the mentorship of Professor Wayne Tilley who remains Director of the DRMCRL. 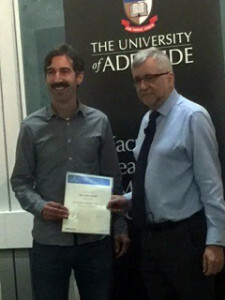 Luke went on to receive a Young Investigator Fellowship from the Prostate Cancer Foundation (USA), one of only a handful of researchers outside of the US to have received the award, and has since received a number of accolades for his molecular biology research, including the SA Tall Poppy Award. Luke is now a chief investigator on NHMRC and NBCF/Movember grants looking at developing the next generation of drugs to treat advanced prostate cancer and breast cancer, and he also leads a program examining the role of microRNAs as biomarkers to better personalise treatment. This entry was posted in News, Research and tagged award, DRMCRL, prostate cancer, research excellence. Bookmark the permalink.